For my second project I planned on whipping up a quick peasant dress with Butterick 5776. When I pulled my pink flamingo shirting out of my sewing basket I decided that the fabric really called for a circle skirt. Doesn't that fabric just seem right for a circle skirt?! So I shifted gears and picked up a copy of Simplicity 2377. I had added a circle skirt to this pattern once before, so I knew that it would work. I quickly constructed my bodice so that I could draft the pattern for my skirt. This was supposed to be my quick and easy flamingo project but as I started to cut out the skirt I realized that my fabric was directional so I wouldn't be able to do the dress without seams. At first I thought about just having side seams, but that would have resulted in some of the flamingos and trees at a 90 degree angle. 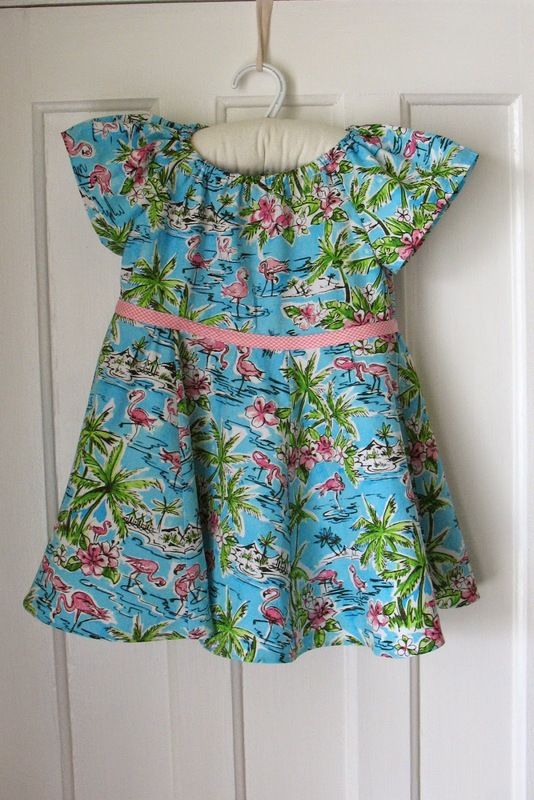 In the end I decided I would cut out the skirt in eight pieces so all of the flamingos would be standing tall. Not such a quick project after all. For some reason when I measured the bodice at 13 inches I thought I was getting the diameter. The fact that I was creating a pattern for a 40-odd-inch finished waist for 20-odd-inch waist didn't even slow me down. I figured that I would just add some elastic to cinch the dress in and went on my merry way. I had to shorten the skirt so that it would work with the fabric I had left. I might need to make some cute shorts to wear underneath. It wasn't until I had all 8 panels sewn together to form the skirt that I realized my mistake. I ended up removing two of the panels and getting a skirt that was just slightly larger than the bodice. Have I mentioned how much I love Clover Wonder Clips? They are so much easier to use than pins. I find that when I use them I no longer hate attaching the skirt to the bodice. I added some pink gingham bias tape to help camouflage the gathers. I centered it over the seam and glued it down with a fabric glue stick before adding two rows of stitching. Adorable! I especially love the fabric!